Every Easter we have the same thoughts…what to offer to our godmothers and of course to my godchildren. 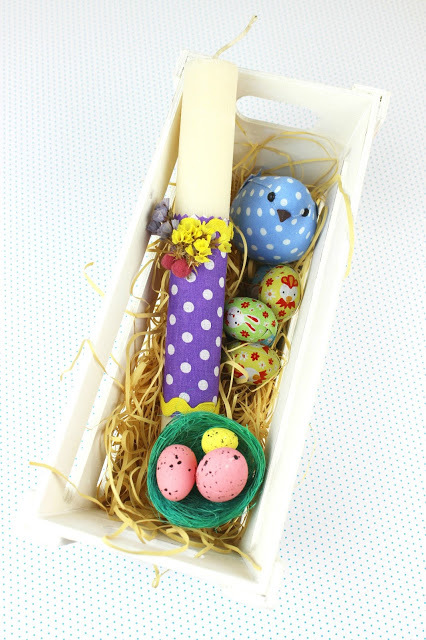 To be honest, for me it is easier to create something related to Christmas than to Easter, but since last year, the only gift that is always welcome and we can made it easily is Easter candle! 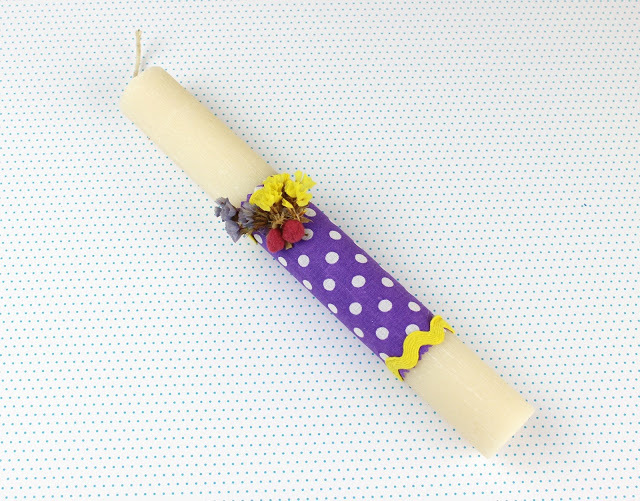 Last year we have created cute candles for our teachers and godmothers, so we have repeated this once more! But this time with more colors and flowers! 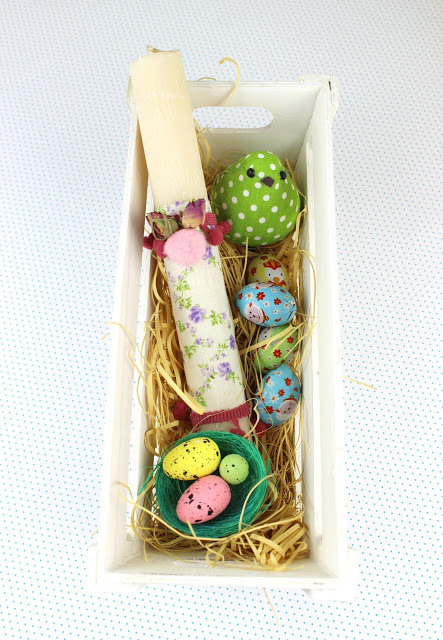 Easter candles actually is something that I adore to create. Because you need just a few materials and with imagination we can create small masterpieces! My beloved fabrics and flowers are again this time the main materials for our candles. This year, my kids helped me with the candles for their godmothers! They have chosen the fabrics and the flowers and of course how to decorate them. The only thing I have done, was to cut the scraps and use the hot glue on the candles. And we are ready! 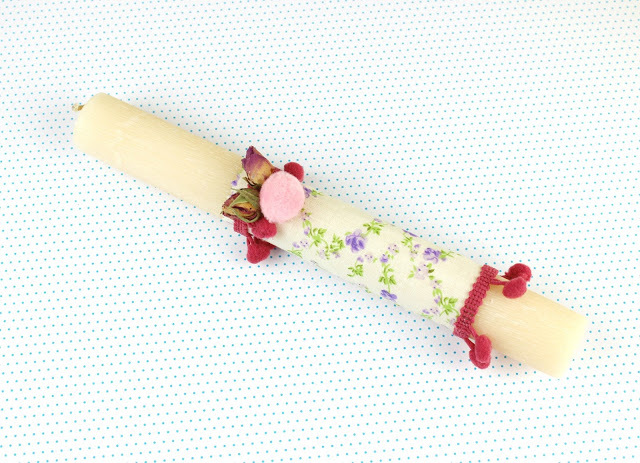 Pom Pom ribbons and cute fabrics and dried flowers and the candles are ready! And a tiny tip? We have put a drop of essense oil on the flowers and the candles have amazing aroma! Of course this was just the beggining, because after these two candles, we prepared more for a couple of little girls! 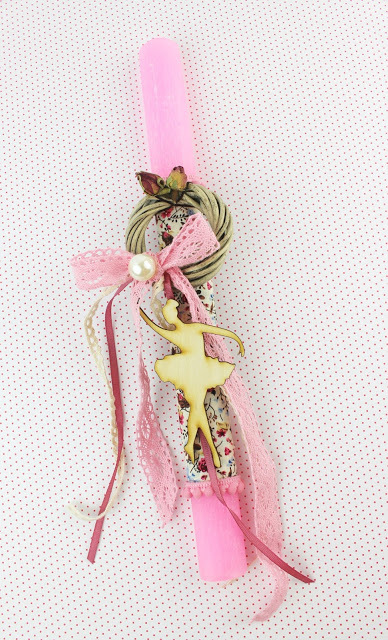 Both of them ballet lovers! So something cute that actually can be removed from the candle and use it in the home decor! Last but not least was the Easter gifts for my beloved godchild, a young lady who actually loves colors! This time I have prepared a set for her, a candle and leather sandals in the same shades! And it was really fun, I love creating sandals, so maybe I will start preparing mine now…. Small wooden baskets, full of little eggs and of course chocolates and the Easter gifts for our godmothers are ready! As you can imagine we have also created painted Easter cards with our wishes! I think I will change my mind… afterall if you create something with love and with imagination, it will always be beautiful. So, even for Easter it is easy to create gifts! So what kind of gifts have you prepared for this Easter? Υπέροχες όλες… Πολύ ρομαντικές!! Ότι πρέπει για μικρές δεσποινίδες!!! Καλό Πάσχα Ζινα μου!!! Πολυ ωραία χρωματα, αλλωστε τα χειροποιήτα δωρα ειναι τα καλύτερα! Σε ευχαριστω πολύ Αριαδνη!!! Φιλακια και Καλο Πάσχα! Χαιρομαι που σου αρεσαν! Σε ευχαριστω πολύ! Καλο Πάσχα! Πολύ όμορφες οι λαμπάδες! Και τα σανδαλάκια! Το τελαράκι με τα καλούδια υπέροχη ίδέα και την κλέβω! Καλή Ανάσταση και καλό Πάσχα με υγεία και χαρές Ζήνα! τα είδα κ στο φβ κ τα καμάρωσα! Σε ευχαριστω πολύ Λιτσα!!! Καλη Ανασταση! Χίλια μπράβο Ζηνάκι! Και του χρόνου να είσαι καλά! Σε ευχαριστω πολύ Κατερινάκι! Φιλάκια!! !